Combining a meditation retreat with a Buddhist pilgrimage, this tour is an exploration of both ancient Buddhist history and living Buddhist traditions. First we explore the ancient sites in the North and East of India, where the Buddha practiced and taught – including Bodhgaya, where it is believed he was enlightened under the bodhi tree. A descendant of this tree is still in the spot. We will have the opportunity to meditate under this tree. I did it in 2017 and it was a highlight of the tour for me. 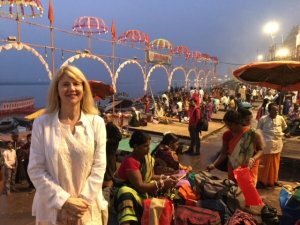 We’ll also visit Varanasi for sunset Aarti at the Ganges and a Sunrise boat ride. Then to Sarnath, where Buddha gave his first sermon – before moving on to the mountains of Dharmsala to experience Buddhist life in the Himalayas. Dharmsala is the home of the Dalai Lama and the Tibetan community in exile. There’s also an optional extension to visit Amritsar and the amazing Golden Temple. Full itinerary and details are here. 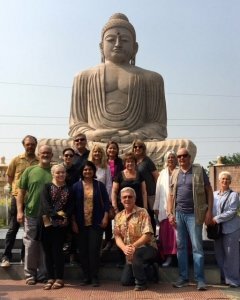 The tour is guided by our expert local guides in India, with Lisa Ernst – founder of One Dharma Nashville and visiting teacher at Spirit Rock Meditation Center in Woodacre California – guiding meditation along the way in various locations, from hotel gardens to Tibetan monasteries.